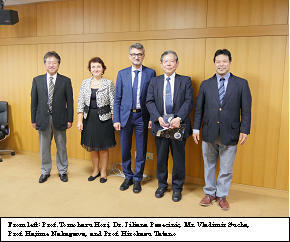 The Director-General of European Commission Joint Research Centre (JRC) Mr. Vladimir Sucha and Dr. Liliana Pasecinic, Deputy Head of Unit, visited the Kyoto University, Uji Campus Disaster Prevention Research Institute (DPRI) during their visit to attend the Science and Technology in Society Forum (STS Forum) held in Kyoto. They received a warm welcome by Prof. Hirokazu Tatano, Secretary‑General, Global Alliance of Disaster Research Institutes (GADRI) and Professor, DPRI. After a brief tour of DPRI research facilities, they met with Prof. Hajime Nakagawa, Director, DPRI, Prof. Tomoharu Hori, Deputy Director, and Prof. Tatano for a fruitful discussion on future research collaborations.